To create a consistent brand identity through use of logo, colors, fonts and imagery to capture the goals, mission and target audience of Jim Heilborn Associates. Business owners looking for an extra hand; Most clientele is in the Furniture Business; Though located in Northern California, he has clients nationwide. Identity to be done and business cards and brochures to be printed within 1 1/2 months for client’s national speaking engagement. 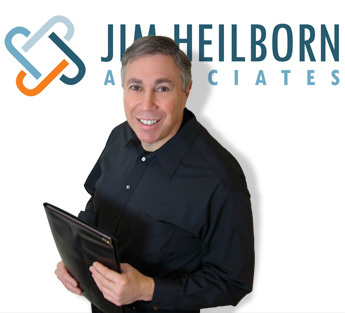 - Jim has experience in the entire business operation; from sales to financials to operations to HR. - Limits client load to focus on each company’s individual needs and finds out what is important to them.